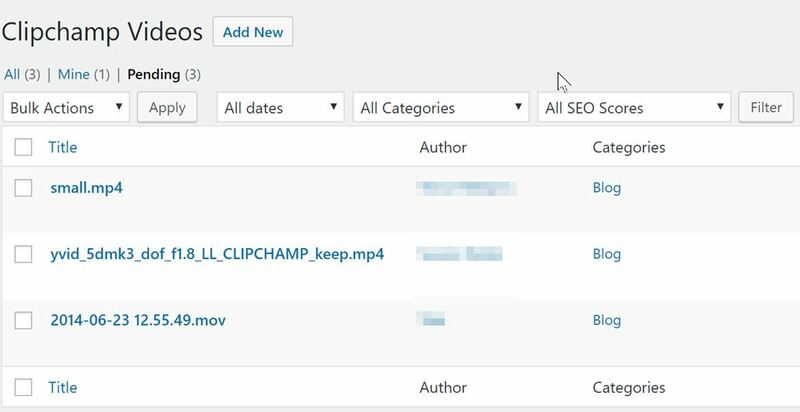 Our Video Uploader & Webcam Recorder plugin lets any WordPress site owner receive videos from their site visitors and users. It is based on our HTML5 video API and brings its features to WordPress. Site owners can use the plugin to offer a webcam recording feature and they can also use it to collect any kind of video file from their visitors including those that people already have available on their computer or mobile device. You can find out more below and try a demo in our own WordPress blog. The plugin includes a free trial phase and a range of affordable plans after the trial ends. Combines a webcam and mobile device video recorder with a smart video uploader. Runs on desktop and mobile versions of your WordPress site. Purely HTML5 based (no Flash! 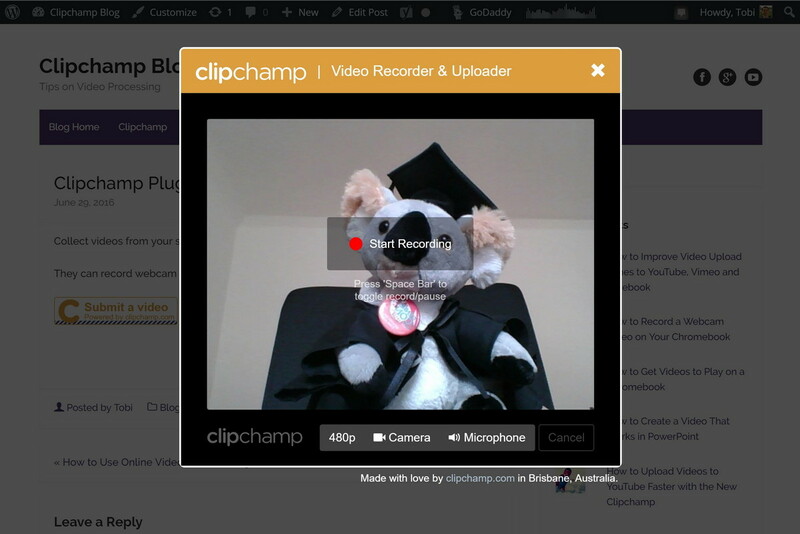 ), meaning your users won't need any outdated, insecure plugins to use your website webcam recorder. 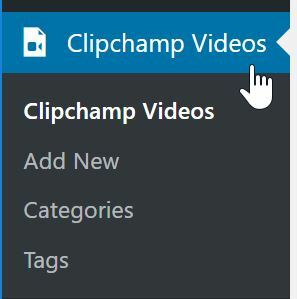 Protects your users' and your privacy by sending all video files directly to you without routing them through Clipchamp servers - we never have access to your videos. Lets your visitors record videos in 720p, 480p or 360p. Accepts a large range of input video formats incl. MOV, MP4, FLV, DIVX, AVI, WebM, WMV, MKV, MPEG, ISO or 3GP and resolutions incl. 4K, 1080p, and 720p. Converts any video file your visitors upload to you into a standard format of your choice (MP4, WebM, FLV,...) before the file gets uploaded to you. Also compresses the videos to a smaller file size at no visible quality loss before they get uploaded. All of this means that your users' videos will upload much faster than with any other video uploader and you will receive them already converted at smaller file sizes, ready to be used. All videos you receive are streaming-ready as well. Furthermore, this significantly reduces or even eliminates your server-side video transcoding requirements and costs. With regards to storage options, you decide where user videos get sent to, options include your YouTube channel, your Google Drive account, AWS S3 buckets, Microsoft Azure containers, or your WordPress media gallery. Available upload options depend on the plan you're on. 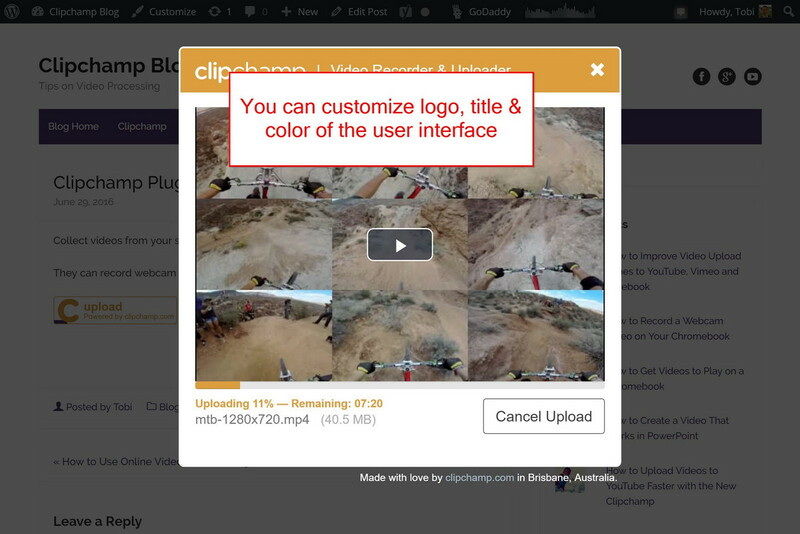 Clipchamp Video Posts get created (and can get posted to the front end automatically) in WordPress every time a user uploads a video file on the front end of your blog or website where a Clipchamp button is embedded. This means that you, your editors and your users can record videos on your website and post them just like they would post blog articles - you can decide if all videos should be visible right away or need to get approved first. Here is a sample Video Post from our own blog, uploaded through a Clipchamp video button and published subsequently like a regular blog post. 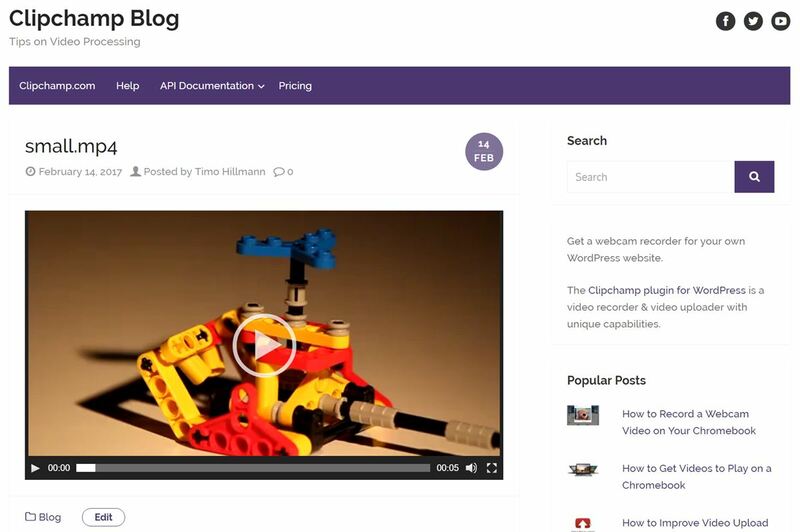 You can put videos into categories and assign tags to them, just like you would with regular posts and pages. 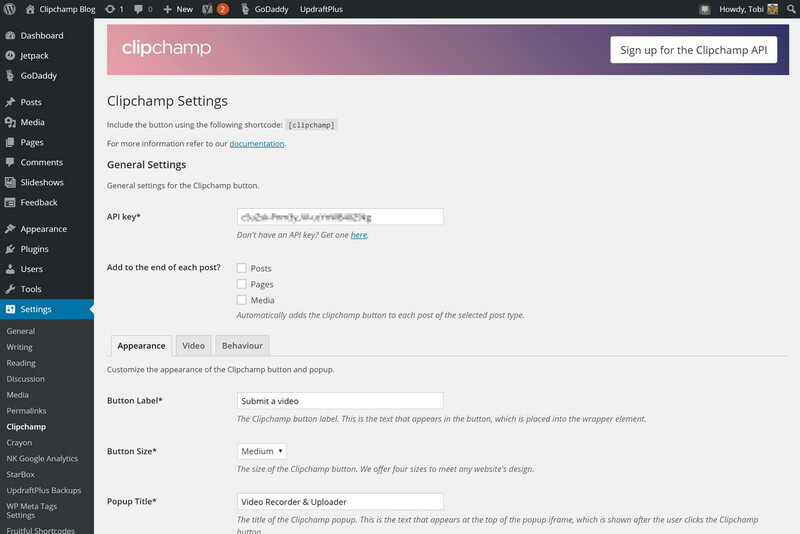 After installing our plugin, you as the blog owner can set up either YouTube, AWS S3, or the WordPress Media Gallery (the last option requires our API Business plan) as the video upload target in your Clipchamp API account and the Clipchamp plugin settings screen in your WordPress admin section. Uploaded videos need to be set to "public" for them to work with this new Video Posts feature. After setting the upload destination and making sure that videos your users upload are set to public (i.e. 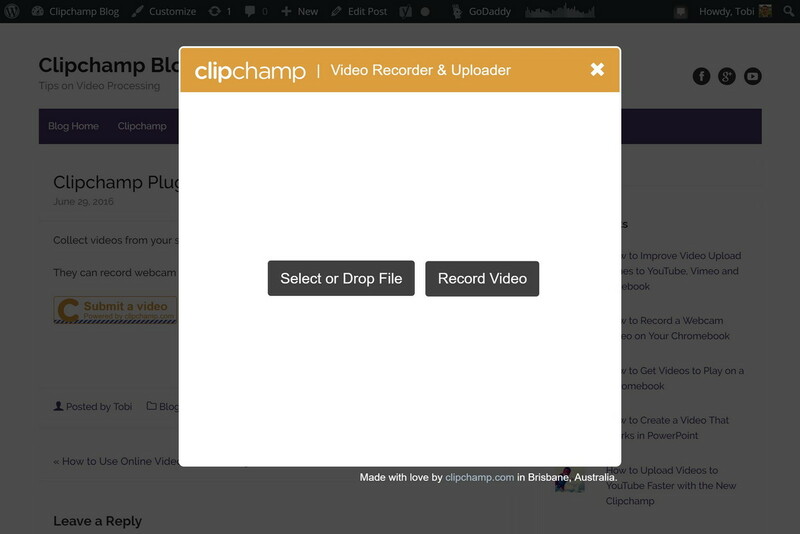 can be viewed by anyone) you can enable "Video Posts" in the related tab of the Clipchamp plugin settings. If this is enabled, each video that a blog visitor uploads will generate a video post entry in the blog, similar to image posts, normal blog posts, etc. These video posts can be made public instantly and appear on the blog like other posts would. Or they can be checked by the blog owner first and only published if desired. This Video Posts feature is an enhancement of existing plugin capabilities and makes it easier to work with videos that visitors record and upload.